Methane hydrate is sometimes called “the ice that burns” because the warming hydrates release enough methane to sustain a flame. USGS. Buried deep beneath the world’s oceans and Arctic permafrost is a mysterious substance that holds the promise of an enormous amount of energy. Created under high pressure and low temperatures when methane molecules are trapped in a cage-like lattice of water molecules, methane hydrate is an incredibly energy-dense substance found in abundance in many parts of the world. These questions need to be answered to understand the environmental implications and technical and logistical challenges of someday trying to produce this energy. Compounding the challenges, methane hydrate is also tremendously difficult to study because it is unstable at surface pressure and temperature. To help unravel the mysteries surrounding methane hydrate, the U.S. Department of Energy (DOE) has turned to a team of researchers led by the Jackson School of Geosciences. The team is currently in the beginning stages of one of the most ambitious research projects in the history of The University of Texas at Austin—a six-year, $80 million project to drill core samples of methane hydrate from beneath the floor of the Gulf of Mexico and bring them to the surface for scientific study. Peter Flemings is leading the DOE-supported methane hydrate project. The project is being led by the Jackson School’s Peter Flemings, the John A. and Katherine G. Jackson Chair in Energy and Mineral Resources in the Department of Geological Sciences. It includes researchers from The Ohio State University, Columbia University’s Lamont-Doherty Earth Observatory, the Consortium for Ocean Leadership and the U.S. Geological Survey. The majority of the funding is from the U.S. Department of Energy, with the balance provided by the research institutions involved in the project. Industry is providing significant data. If all goes as planned, crews will be drilling core samples in 2017 from a leased rig, and again in 2019, potentially using the JOIDES Resolution, the ocean drilling research vessel of the International Ocean Discovery Program. Teams of scientists will perform tests on the samples in 2020 at a specialized lab being built at the Jackson School. The Jackson School Newsletter spoke with Flemings, the principal investigator, about the project. A: No. It looks like ice, but it’s not. When hydrates melt they separate into gas and water. And that’s very different than ice melting where all you have is water. A: At the heart of the proposal is the desire to drill methane hydrates in the marine setting and recover actual core from the methane hydrate reservoir. It’s fairly common in the energy industry to core when you drill a well. The difference here is that methane hydrate is stable at high pressure and low temperature at the bottom of the ocean, so if you don’t have a way to bring it to the surface under pressure it will just bubble away. Q: How will you accomplish that? technology is called pressure coring. We are continuing to test and modify the tool that has been developed for this. The tool, which is very complicated and probably 90 feet long, goes inside the drilling assembly. The objective of that tool is to core and take that core and put it inside a metal enclosure that is sealed under pressure and then lift that pressurized core up to the surface. Then, when you get the core on the deck, you have to transfer it from the pressurized coring container to a pressurized analysis facility. This tool has been used in India, South Korea and China. Based on those experiences, we are making a series of modifications to make it drill better and to improve the ability to recover full core and preserve that core under pressure. A: The purpose of that was to test the tool and to get UT up to speed on the technology and how to deploy it. In fact, when I wrote the proposal, even after they funded us, they said, ‘by the way, this tool needs some modifications to work more effectively, and you’re going to need to fix it.’ So we’ve got work to do. 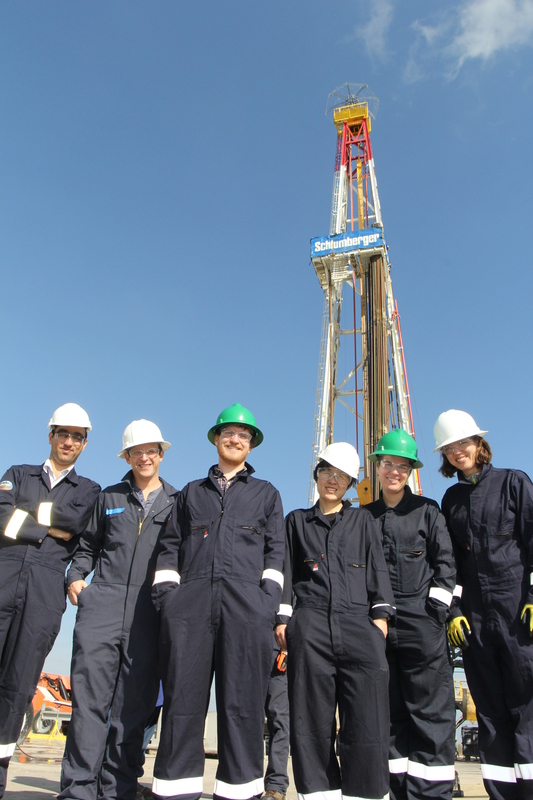 For the field test, we went out to an experimental rig owned by Schlumberger. 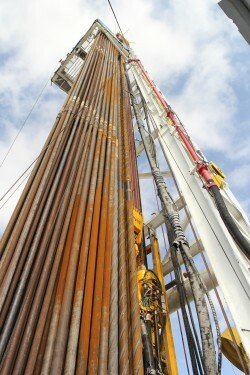 We spent two weeks drilling down into the Eagle Ford formation and did a series of coring tests. A: We actually have two types of coring tools that are slightly different technologically, and we tested both those tools. One of those tools performed significantly better than the other tool, and it was not the tool that anyone predicted ahead of schedule. So we’ve got two tools we are modifying now. We’ll take two tools to sea on this test. Q: So you’re testing the tool at sea? Mexico industrial company. Our drilling requirements are not that deep. We’re going up to 1,000 meters. It’s almost a $10 million program. This is a huge test, and it is only a part of our entire drilling program, which may be the single biggest contract UT has received. A: If you go to the bottom of the ocean out in deep water —thousands of meters of water depth— it’s a couple of degrees Celsius and the pressure is high. As you go down, the pressure increases but the temperature also increases. So there’s only this specific layer that contains methane hydrate. It can range in thickness, but we are looking somewhere within the first 1,000 meters below the seafloor. It’s only above that depth that hydrates are present, and it seems like hydrates are more present near the bottom of that depth. In geology we often talk about shales (or mudrock) and sands. The type of deposit we’re looking for is hydrates that are locked inside the sand beds. That’s important because historically there has been work done on methane hydrates in shales. sands because they are permeable so the fluids flow, the thought is that if we can find sands full of hydrate, those have the potential to be the most economically viable. Schlumberger’s Cameron Test Drilling Facility. Jackson School —in the basement— called the pressure core center. This is a long-term thing. This is going to be a facility where we will store these pressurized cores and also have the ability to analyze them. Once you’ve got these pressurized cores, you have to transfer them under pressure to do anything you want to do. able to take these pressure cores, cut a little sample, and then slide it into an experimental device that is under pressure and maybe do a CAT scan, a flow experiment or maybe perform a Raman spectroscopy. The thing always has to stay under pressure, so it’s actually significantly complicated technology. We’ll store everything here and we’ll have a whole experimental facility at UT, but we’ll also serve as a library. We’ll provide samples for other people and institutions to study. Q: Are these type of facilities common? A: No. This will be one of the very few laboratories in the country to do this type of work. A: The question is: will climate fluctuation destabilize the methane hydrate? The scenario is: if we have a little bit of global warming, that could destabilize the methane under the permafrost, the methane then bubbles up into the atmosphere and that accelerates the global warming. That’s a big question right now—are methane hydrates destabilizing and contributing significant amounts of methane to the atmosphere? The focus of the study is not related to the climate issue. But to flip it around, I would say that the understanding you get about methane hydrates, about how they form, about their habits, their concentrations, I think that’s going to be hugely helpful to these issues. I just don’t think there’s any doubt about that. unbelievable. How much is there? A: The numbers over the years have varied incredibly. The most recent numbers just for the Gulf of Mexico are on the order of 700 trillion cubic feet(TCF). We’re talking hundreds of years of supply at current gas consumption rates and that’s just the Gulf of Mexico. Furthermore, methane hydrates may contribute to long-term energy security within the United States and abroad. Many key global economies lack clean and secure energy supplies but have potentially enormous hydrate resources. A: There’s all kinds of people who study hydrates for different reasons, but the DOE’s focus here is as an energy resource 30 to 50 years out. Methane hydrate has an incredible energy density, so if you could produce it, it is a significant resource. prices as low as they are? A: I think this is going to be really hard. It’s thousands of feet down. It’s going to be expensive. I find this a challenge to envision how we would make this economically viable, especially now with low gas and oil prices. But have you ever held a piece of gas shale? When I hold that in my hand and look at it, I say how the heck are you ever going to produce (energy from) that? But right now, that’s why oil and gas prices are so low. 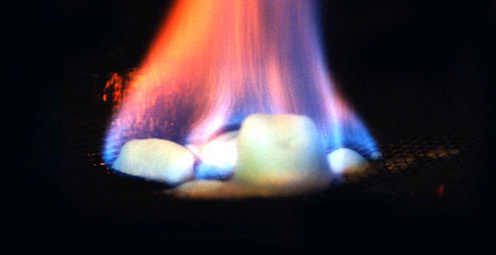 The DOE has the same vision for methane hydrate. They say we plan to do the first order technical exploration to see if this could come online 30 years from now. Among the great challenges of studying methane hydrate is that scientists aren’t sure how it forms and don’t yet have the tools to study it in the natural environment. 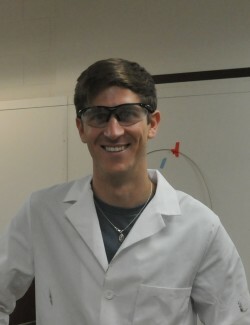 Jackson School Ph.D. student Dylan Meyer has spent the past two years trying to work around this problem by creating methane hydrate in an experimental lab in the basement of the Cockrell School’s Petroleum and Geosystem Engineering building. Meyer is one of the many students working on the methane hydrate project spearheaded by Professor Peter Flemings. He uses a unique method that he believes—and hopes —mimics the forces that form methane hydrate in nature. “We’re really trying to get a first order understanding —to peel back the layers on what we actually know,” Meyer said. Subsurface methane is formed either by the breakdown of organisms that died over millions of years and have been buried under the seafloor or by microorganisms that produce methane as a byproduct of consuming organic matter in low-oxygen environments. Mahdi Heidari, Kevin Meazell, Kris Darnell, Baiyuan Gao, Tessa Green and Carla Thomas at the Land-Based Coring Test In December 2015. How that methane is turned into a hydrate is an open question, but Meyer said there are likely a number of processes at work, depending on where in the world it forms. The way Meyer makes methane hydrate in the lab is meant to mirror Flemings’ theory of how the hydrates form in the dipping sand layers found in certain regions of the Gulf of Mexico—areas that Flemings’ team plans to take pressurized core samples from in the coming years. The process of making the hydrates involves injecting pressurized methane into a cold, brine-saturated sand sample. 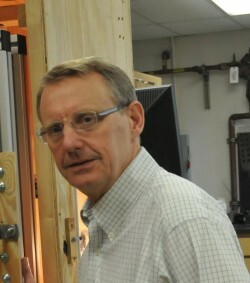 Meyer then varies the flow rates and clay content and analyzes the hydrate formation response using several techniques, including computed tomography (CT) scanning.